It's no secret that cotton candy tastes as good as it looks... at least that's what I thought as a child. As an adult, slightly mortified by the size of the cotton candy handed to my children, I decided the only way to minimise the 'risk' of a sugar-od was to eat some of it myself. I confess I was rather excited and pulled a large fluffy tuft off each stick, (to be fair, to be fair), and then popped both bits into my hungry mouth at once. Hmmm.... I'd forgotten that weird, almost wiry texture as it melts in your mouth, and the super sweet rush of sugar that follows. Somethings are better left in the sanctity of memory's fond treasure chest. 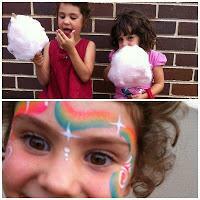 As to whether the 'risk' of too much cotton candy was real or not - you be the judge - the bottom photo shows my eldest daughter about an hour later at the same fete... yah-ha, I'm sure you'll agree that her wide eyed wonder is a tad toooooo wide! Take care, and stay away from sugar!